You have probably heard of the “Orient Express,” the luxury train immortalized in Agatha Christie’s novel, that used to link Paris (and once London, too) to Istanbul. Sadly, that route is no longer in service; however, today a similar train runs from Ankara to Kars in Turkey’s easternmost region, covering 1,310 kilometres in about 24 hours. As soon as we learned about the existence of this train, my girlfriend, Angeliki, and I decided to do it. 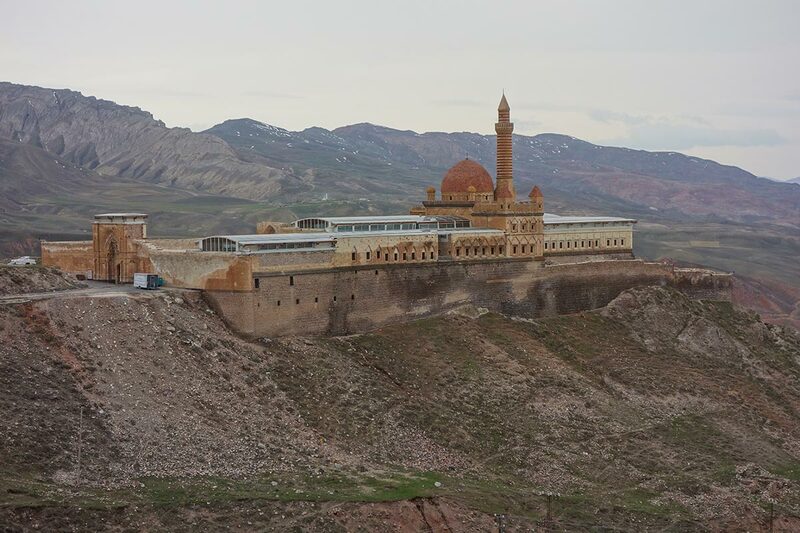 The ancient Ishak Pasha Palace in Eastern Anatolia. Getting the “Doğu Express”—the Turkish Eastern Express, in English—also gave us the perfect excuse to visit Ankara, Turkey’s capital and second largest city. “The best thing in Ankara is the road to Istanbul”—so says a proverb popular among the people from Istanbul. And while Ankara can hardly be considered a beautiful city, the proverb is ungenerous, and we didn’t regret spending a couple days there. Among the dull architecture, there are some worthwhile sights, such as the hulking Anıtkabir (the mausoleum of Mustafa Kemal Atatürk), the namesake castle (a bit neglected but established in the 2nd century BC), some interesting Roman ruins and fine museums—particularly the excellent Museum of Anatolian Civilizations. 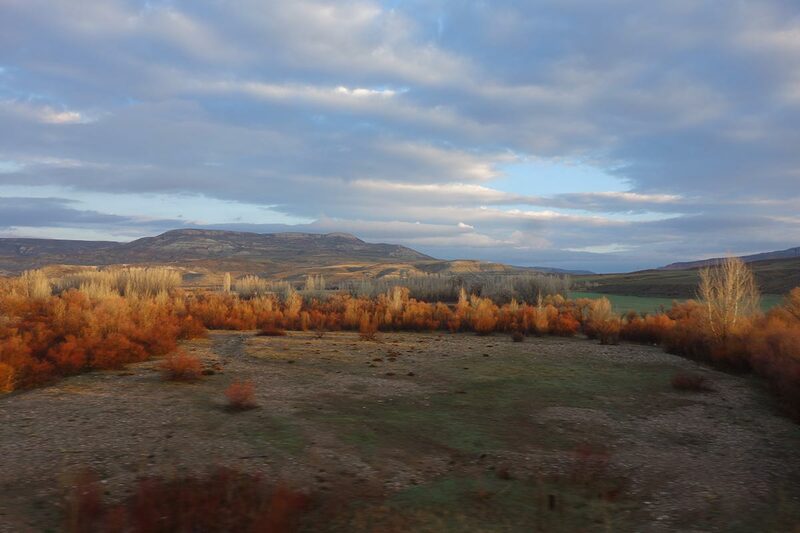 The journey on the Doğu Express was nothing short of spectacular. Although the train is a bit outdated and kind of slow, and the couchettes not very comfortable or spacious, in return we got to see incredible scenery out the window: snow-capped peaks, old stone bridges, placid mountain lakes, wide rivers and foamy rapids running through rocky gorges, tiny villages and green plains. The train ride along the Dogu Express. When, after about 20 hours, we got off the train in Erzurum we were so delighted that we regretted having to leave it. The largest city in Eastern Anatolia and the highest in Turkey (1,757 metres), Erzurum is a popular destination for ski holidays, as the Palandöken ski resort lies just a couple kilometres away from downtown. Of course, the ski facilities were closed in spring, so we spent our day exploring the city, famous for its impressive Seljuk architecture: ancient mosques, caravanserais, a citadel, tombs and the Çifte Minareli Medrese, a 13th-century religious school, with its iconic twin minarets. Erzurum, with its infamous Çifte Minareli Medrese in the distance. 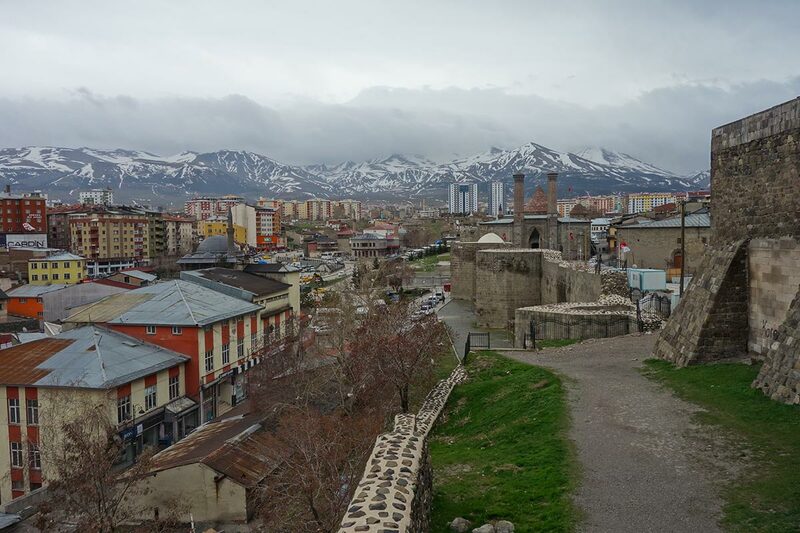 In Erzurum we rented a car and continued our journey on four wheels eastbound to Kars. Way smaller and less livable than Erzurum, Kars is the last city before the border to Armenia, a border that has been closed for decades due to diplomatic tensions between the two countries. Kars’ main attraction is, without a doubt, the imposing castle offering fantastic vistas over the city and the surrounding mountains. Despite not being very pleasant to walk around, we saw some remarkable historical structures: Turkish baths, stone bridges, mosques (some are actually converted Armenian churches) and some Russian-era buildings which now serve other purposes or are in a state of neglect. All these monuments reflect the multicultural background of Kars, a crossroad where Turkish, Armenian, Kurdish, Georgian and Russian cultures meet—or at least used to. 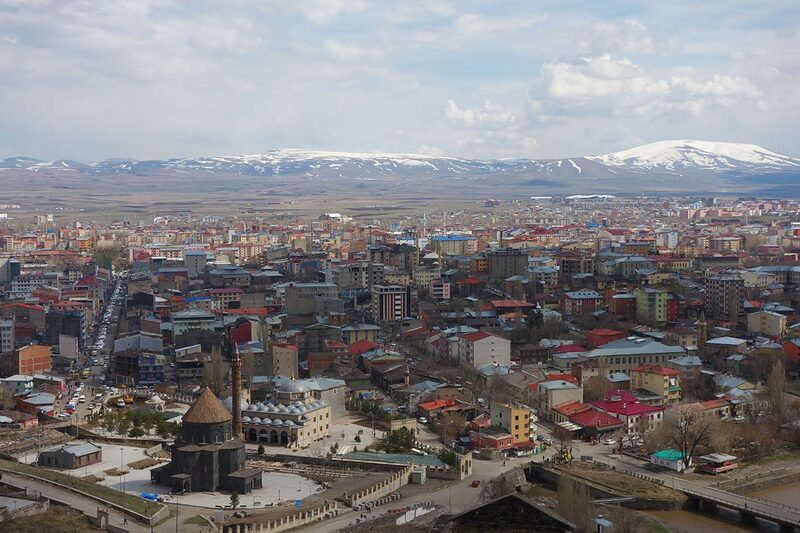 The city of Kars, the largest city near the Armenian border. The most vivid testament to the glorious past of the region is Ani, a ruined medieval city located some 45 km east of Kars. As soon as we passed through the massive city walls, we found ourselves in front of a stunning scene: a vast plateau delimited by dramatic ravines, scattered with monumental ruins standing out in the blue sky. The only sound we could hear while wandering around was the wind shaking the grass and howling through the windows of the abandoned churches; our only company were the shepherds with their herds and the vultures hovering above the crumbling buildings. 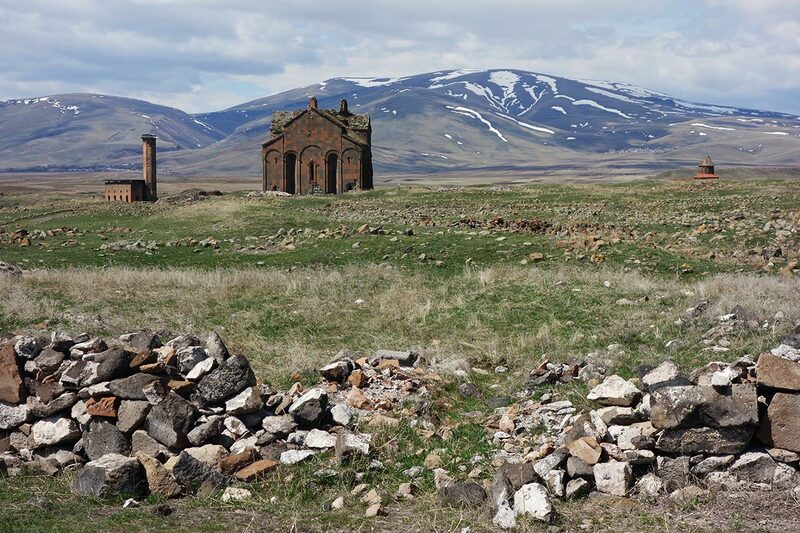 It’s hard to believe that before falling into decay and oblivion, Ani was once the capital of the Bagratis Kingdom of Armenia (founded in 961) and a flourishing trade center on the Silk Road for centuries fought over by empires. Who of its 100,000 inhabitants could foresee such a tragic destiny for this glorious city? 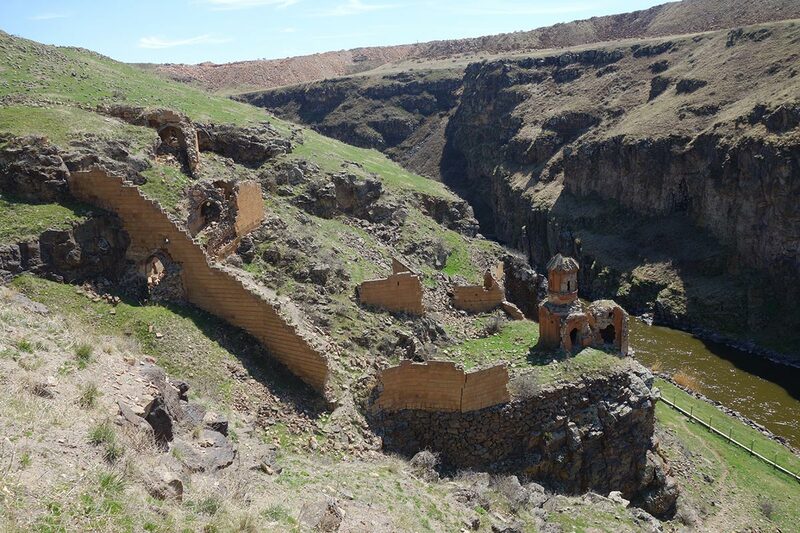 The ruins of Ani in Eastern Anatolia. The next day, while making our way south, we stopped over in the Kurdish villages of Keçivan and Çengilli, located 2,000 metres high on the mountains. In retrospect, considering the steep, rocky roads, getting there with a normal car was risky. However, we were paid back by bucolic landscapes and the warmest of welcomes by the villagers. 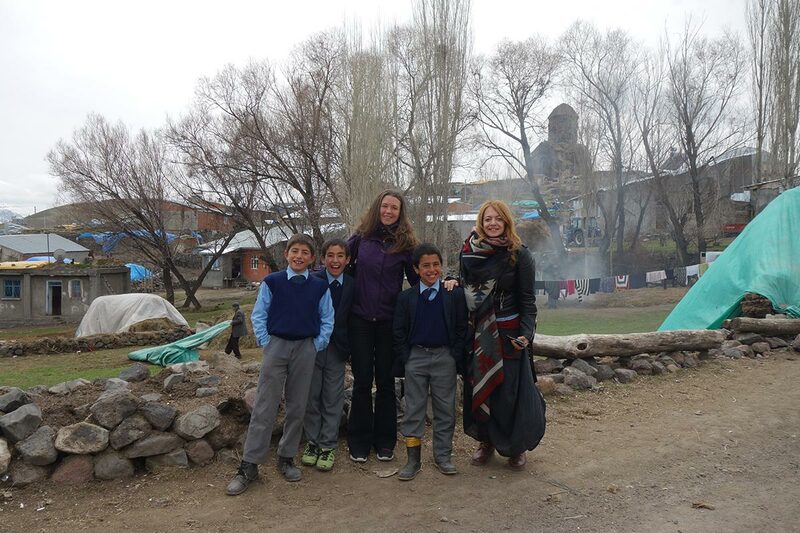 In Keçivan we quickly befriended two shepherd boys who showed us around their humble village, incredibly built inside the remains of a 9th-century castle. In Çengilli, a whole class of schoolboys escorted us to the remarkable ruins of a Georgian monastery. To thank them we bought ice cream and chips for everyone. The boys of Çengilli, a mostly Kurdish town. The next stop of our Anatolian trip was the largely Kurdish town of Doğubayazıt, which I will remember for three reasons: the majestic bulk of Mt. Ararat dominating the landscape; the single-digit number of women we saw on our only night there; and the magnificent Ishak Pasha Palace, an Ottoman complex with exquisite reliefs. Entirely built in light brown local stone, the palace is one with the hill where it is superbly located. Within the finely carved walls of the palace we felt carried away in the mystical atmosphere of Arabian Nights. Since we’d gotten that far already, we decided to go to the end of the line: the Iranian border, just a few kilometres east of Doğubayazıt. On the way, we had time to check out the alleged landing site of Noah’s Ark, facing the white slopes of Mt. Ararat. I must admit that the mound indeed resembles the shape of a boat, even if it takes a lot of imagination to believe what they claim it is. Later, when we wanted to see the meteorite crater that lies right at the border with Iran, we had to leave our passports at a military checkpoint. Too bad we needed a visa to enter Iran—otherwise we certainly wouldn’t have stopped there.